The Photos in this post have all been supplied by the Residential Judge, Diana Harden. Thank you Diana for permission for their use. This is a representational selection of some of the gardens in the competition. This second placed garden in Home garden block size up to 600 square metres was one of the hotly contested categories in this year's competition. Beautiful subtropical feel to this Category 3 garden block size from 601 to 10000 square metres at Boambee East. The block had a very steep slope which had been terraced. The jasmine was a very heady inclusion to this garden, it was just out at the right time for the competition. Second in the 601 to 1000 square metres this block was quite steep with terracing and steps leading down through the subtropical canopy. This clivia knew when it had to put on a show! Looking special indeed. Many interesting plants and foliages to be found here. I loved the maiden hair fern on the back patio - it reminded me of my much loved Aunt Flo. This garden is a real hidden retreat up on the headland at Woolgoolga with the sound of the ocean as a constant background. Tall trees form a windbreak from the constant salt laden sea breezes. Wide expanses of lawn enhance the 'Retreat' feel to this large property. Extensive plantings of Australian flora have been used to form the framework to this lovely garden. What a delightfully beautiful and charming space has been created on this rented property in Toormina. Mary has planted punnet upon punnet of seedlings and established a kaleidoscope of gorgeous colour with many quirky elements. The category for home garden, caravan or mobile/relocatable home was very diverse. Relocatable homes don't necessary mean that they have small pocket hankerchief-sized patches of garden to the front. In this competition there was a 'double block' in Darlington Park which was just lovely. A difficult site to manage as a garden, due to tidal/heavy weather events affecting this site, so it floods quite badly periodically. Julia has come up with some wonderful strategies to counteract these 'mercy to the elements' happenings. To the rear of her block there is a debris chocked stream which is tidal with king tides and if this occurs with major rain the block floods. Julia has put in place sturdy hard landscape - in the form of rocks with gaps which allow the water to recede without taking all her plants and soil away with it, very clever. There are also quite robust plantings in this area for example, clivias. This lovely relocatable site at The Pines, Woolgoolga although smaller comparatively speaking, Melinda has made use of every bit of her available area. There was clever landscape, especially to the rear of the site and a beautiful private area to the front. 'It is very encouraging to have so many entries in these categories. There were examples of neighbours at Marion Grove, working together to create a unified space to be shared and enjoyed by all. Of special mention is the Brook Eden Project at St Joseph's where accessible raised garden beds have been built for the residents, to plant herbs and flowers. What started out as a project to get plants out of pots and reduce trip hazards, has proved to be so beneficial, popular and successful, that the project has moved into the next courtyard, with a succulent garden, water feature and vertical garden. For the courtyard/patio there were many excellent entries, making this a very challenging task to choose the winners. Such a diverse group with clever use of existing hard landscapes to create beautiful spaces for enjoyment. Brick terracing was used often to elevate pots which had varied plantings of colourful, textured foliages and flowers. The use of mesh to provide climber and espaliered plants a support, making use of a vertical space and backdrop, very pleasing. The use of pots with herbs and small vegetables offering a practical incorporation to the gardens. These gardens are in Gundagai Place, which took out first prize for Category 10 - whole garden of complex operating under a Body Corporate structure. Category 16 - New home, new garden. This year was really exciting as there were fantastic entries within the Coffs Harbour Council area. 'Many high quality entries and a wide variety of styles. The winner was chosen as the new landscaping, garden beds, steps and paths were well suited to the architecture of the house and the sloping site. The owner is a quilter and has designed her planting with a quilter’s eye for colour and texture. This garden is going to look stunning as it matures. There is a delightful deck overlooking the back garden and a hidden shaded nook underneath to 'take a spell' in the shade on hot days. A garden full of wonderful annual colour and some of my all time favourites - sweet peas! All the gardens in this category are extraordinary in that they were all very recent gardens but looked so well established. A credit to their owners on a job well done! A totally different approach to this new garden with sculptural, modern plantings with hard landscaping that will not require too much maintenance. A top garden which has some beautifully prepared beds with on-going crops to support a growing family. 'Many high quality entries. The winning entry was an immaculately maintained, mulched, organic garden with companion plants and innovative use of recycled gutter fixed to a wall planted with strawberries. This garden was screened for protection. 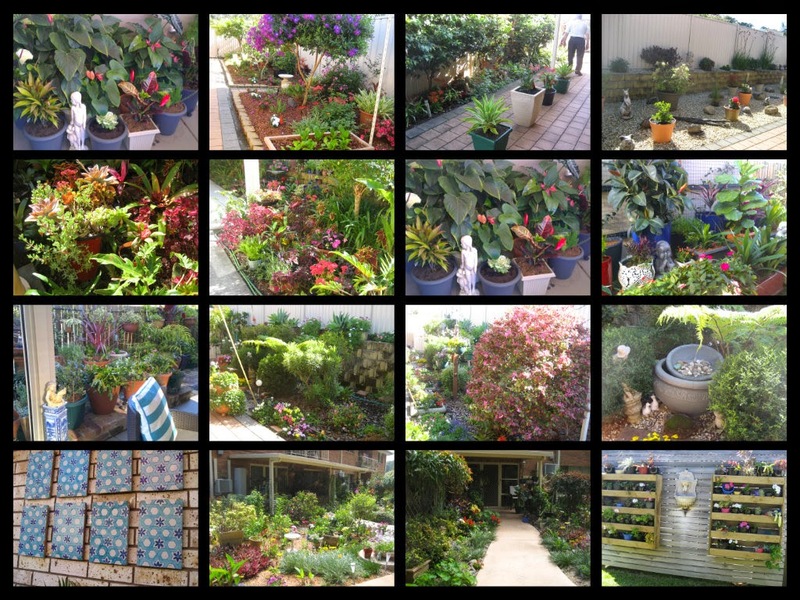 Mary's productive embellished garden in Toormina which took out the small vegie garden award. This Balinese Pavilion took out the first prize in the Best Garden Feature. This entrance and arbour was chosen for a prize because it reflected the architecture and colour palette of the house it leads to. The winner of the First Time Entrant compost bin prize was Sandra & Peter Vereyard, it looks as though it has gone to a very good home.